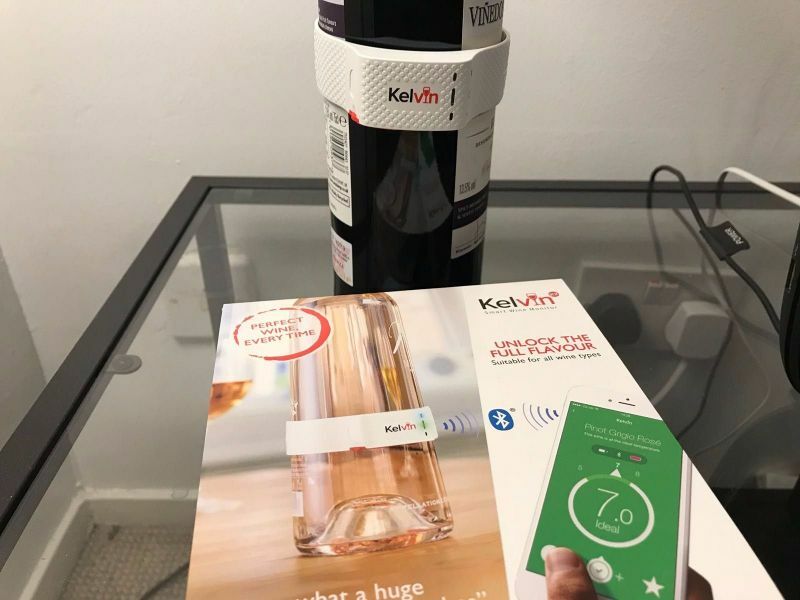 Disclaimer: We were given the Kelvin K2 Smart Wine Monitor that we review in this article. The normal setting for a domestic fridge is about 4°C (39°F), so any wine that has been stored there will be too cold to be enjoyed at its best. You can put a bottle in the fridge for just an hour or so, but that requires delaying your enjoyment for what, after a day at work, may seem like an eternity and you still have no guarantee that the bottle is correctly chilled. The Kelvin K2 Smart Wine Monitor is a gadget that offers a solution to this problem. It is a flexible white plastic band that can stretch to fit around the widest part of a wine bottle. In the middle of the band is a sensor that presses against the glass of the bottle, a rechargeable battery, some lights, and assorted electronics to communicate with your phone. There are free apps for iOS (Apple phones) and Android (Samsung, Pixel, and assorted other phones). The app pairs with the Kelvin K2 SMart Wine Monitor in the same way as Bluetooth headphones. The pairing worked without a hitch. Once the device is communicating with your phone, you slip it around the bottle. Then select the type of wine whose temperature you are monitoring. You can either this by body and colour (e.g. Light bodied white) or by the precise type (White Sancerre). The latter option provides information and tasting notes about the wine as well as the correct temperature. The Kelvin K2 Smart Wine Monitor can stay linked with the phone even from within the fridge. It does take up to five minutes for the device to adjust to the bottle’s temperature. You can pair with multiple devices; the box comes with several coloured stickers to allow you to identify with which K2 device you are working. Options in the app allow you to select alerts when the correct temperature is reached. You can select to see temperatures in Celsius or Fahrenheit. My inner geek was disappointed that despite the name, degrees Kelvin was not offered as an option. 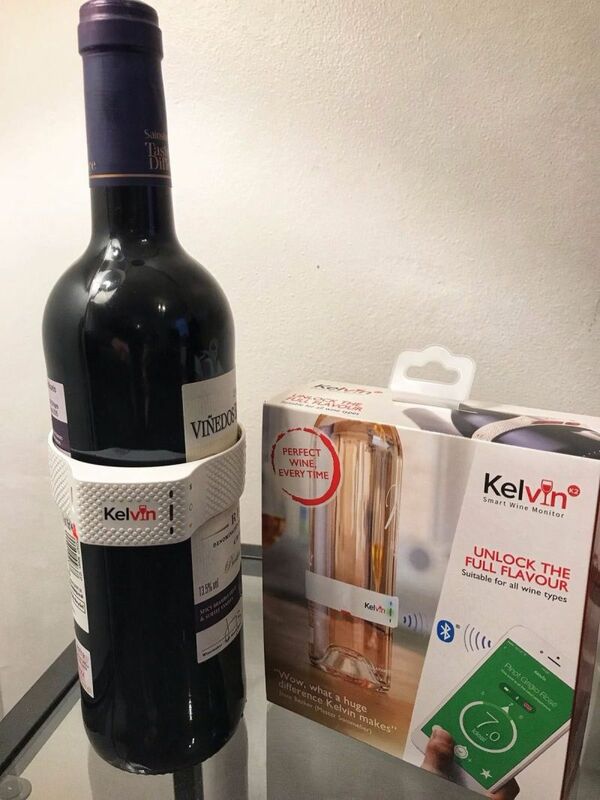 The Kelvin K2 Smart Wine Monitor is charged via a standard mini-USB cable, the same type that is used by Kindles and most non-Apple rechargeable devices. A cable is included in the box. I used the K2 on a bottle of Sancerre that had been at room temperature. I placed it in the fridge with the K2 attached. After a little more than an hour, my phone alerted me that the wine was ready. I took a glass and put the wine back into the fridge. Before my second glass, I checked my phone and now the temperature was too low. A few minutes on the kitchen counter and it was once more at the right temperature. I know some of our readers care little for white wine, preferring to drink red. However,he Kelvin K2 Smart Wine Monitor is also useful for bottles of red wine. Most people will serve red wine at room temperature; typically about 21°C (70°F). However, red wine should be served 12-18°C (54-64°F), cooler than the typical house. A few minutes in the fridge will improve the flavours and with the K2 you can ensure that you do not leave it for too long. Amber and I are away from home, staying in the UK. Back in the US, we have a white fridge set to 50°F so that any white wine is in the correct range. We have a wine cellar that is set to an appropriate range for red. Here in our London flat, we have a room temperature sideboard or a fridge; so the Kelvin K2 Smart Wine Monitor has become almost as important tool as our corkscrew. The device sells for £39.95 in UK and $49.99 in the US. I wish more restaurants would pay attention to the temperature of the wines they serve. Can’t count the number of times I’ve asked for a chill bucket for a bottle of red. Sounds like this gadget works well for home use; might have to check it out. So true Lauren. In Napa, even in wineries, I can’t tell you how often I am served overchilled wine. How the heck can I taste anything if its overchilled. I am sure that it loses a lot of people from buying great white wines in particular.